The word FAITH is described in the dictionary as “Belief or trust – a belief in, devotion to, or trust in somebody or something, especially without logical proof.” Trusting in the unknown can be scary but if you think about it we put our faith in ordinary things everyday – we have faith that our car will start when we turn the key, we have faith the light will go on when we flip the switch, we have faith that water will come out when we turn on the fawcett. So why has it been so difficult for so many of us to have faith in GREAT LOVE? Could it just be that we don’t expect it to be there. That our past experiences have influenced our present. What if we just made a conscious decision and intention to release all our doubts around LOVE once and for all. Wouldn’t it be amazing not to give another thought about having true love in your life but simply having faith that it will show up. And for some of us, trusting that it already has. Soulmates died 10 minutes apart after a “lifetime of love.” According to Yahoo! 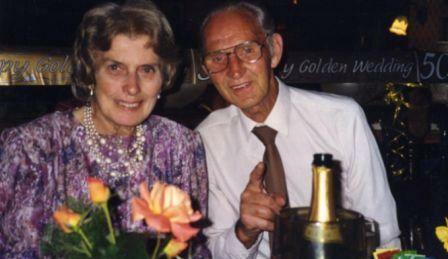 News, Harry and Mavis Stevenson died within 10 minutes of each other after a 65-year-long romance. The English couple had been living together at the St. Werburgh’s House Care Home in Derby after Mavis fell ill. Harry couldn’t stand being apart from her, so he moved into the home too. “The Stevensons’ family was not surprised when Mavis passed away on Nov. 3 at 89 but was shocked when her 88-year-old husband — who was in good health — shed a few tears and died by her side just minutes later,” reports Yahoo! News. The soulmates died 10 minutes apart after spending their lives together, even when they weren’t physically together. Mavis waited for Harry’s return from World War II, and the two were reunited after he fought in the battle of Normandy on D-Day, and they got married shortly thereafter. Family members say that it was Mavis’ love that pulled Harry through the tough times overseas. “Their love lasted and they were devoted to each other. I can imagine them being together now, after their death, side by side. Their romance and their love kept them together during those years. When there is absence, then the heart grows stronger,” said Mavis and Harry’s nephew, Stephen Cresswell, 63. According to WTVR, Cresswell said that the way his aunt and uncle passed away made sense, and was for the best. Although it is sad, this happened for a reason, and it truly was the “perfect ending” for the couple. “They would not have wanted to live without each other, so I think it was the perfect ending,” Cresswell said. How can you create more togetherness with the person you love this week? Just take one step in faith. This entry was tagged Create Great Love, Faith, Faith in Love, Great Love, Jonathan Safran Foer, Love, Mavis and Harry Stevenson, Relationships, Soulmates, Soulmates Died 10 minutes apart, Togetherness, Trust, Yahoo news. Bookmark the permalink.